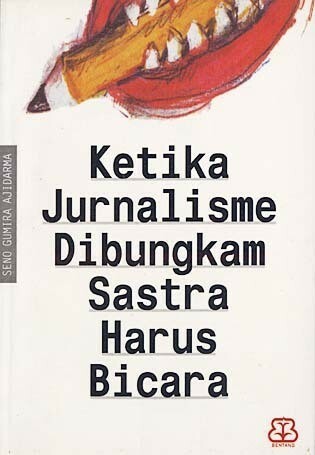 Cover of Seno Gumira Ajidarma, Ketika Jurnalisme dibungkam hastra harus bicara (When Journalism is Silenced, Literature must speak). The most famous Indonesian literature outside the country is the Buru quartet of books by the writer Pramoedya Ananta Toer, written while Pramoedya was a tapol on the island of Buru.4 The writings of Eka Kurniawan also reference the 1965 killings.5 Half a century later, debate about the “1965 events” continues to face challenges, even in post-Suharto democratic Indonesia.6 Literature may speak more freely than journalism even now. The Indonesian armed forces invaded Timor-Leste (East Timor) in 1975 and colonized it for 24 years, with the cost of more than 100,000 lives – estimates of the death toll run as high as one-third of the population.7 Timorese students were forced into the New Order educational system, which placed heavy stress on a nationalist view of Indonesian history and continually underlined the regime’s basis of legitimacy as the force that vanquished an alleged communist coup effort in 1965 and “saved” the nation. Only after the fall of Suharto and the dismantling of his “New Order” system of control were the Timorese granted a referendum, in which they voted overwhelming for independence. After the fall of Suharto, Timor-Leste was able to regain its independence and elected governments took office in Indonesia. Indonesian civil society activists, long repressed, burst into the open. It became possible at last to discuss the “1965 events” more openly. At the same time, the Indonesian military and elite figures linked to the New Order remain influential, and have often resisted the more open tone of conversations about 1965. As Indonesian military elites try to downplay discussion of the massacres that engulfed their country in 1965, a powerful new poem from emerging Timorese writer Dadolin Murak expresses solidarity from now-independent Timor-Leste for the victims of 1965 and those trying to debate the 1965 tragedy today. “General!” is a wake-up call and a warning that is receiving wide distribution in the Indonesian language. It is an intervention from a formerly colonized land into Indonesian debates by one of a generation of Timorese intellectuals who came of age within the New Order educational system, but also within Indonesian pro-democracy activism. In 2017, he published “General!”, a powerful “poem of solidarity from Timor-Leste for the discussion of the 1965 tragedy in Jakarta and victims of the 1965 tragedy.” Written in Indonesian (Bahasa Indonesia),8 it aims, as Murak writes, to speak to silences and to help advance the Indonesian national debate on the 1965 killings. It opens with a reference to the way the 1965 coup was taught to the poet and other students during the Suharto era, passes through a litany of the suffering of Timor-Leste under Indonesian occupation, and ends with a call of solidarity with Indonesian activists that echoes solidarity from Indonesian activists for Timor-Leste expressed back in the 1990s. “General!” was not published in a literary journal or book. Instead, it was part of a proliferating “Facebook literature” of poems and prose in the highly-networked world of Indonesian-language Facebook. Below is the English translation of the poem “General!” with explanatory notes. An edited transcript of an interview with Dadolin Murak follows.